The Archbishop's palace, which rose on the river bank near the cathedral, was destroyed in 1831. Only the bridge kept its name. Formed by three stone arches, it was opened in 1828, the day of the feast of Charles X. This bridge had the characteristic of opening onto the entrance to the Morgue, transferred in 1864 to its north end, where it remained until 1923. The bodies of those who had died in prison, in the street, or had drowned, were taken there. Guillaumin had occupied, Daubigny's former studio, at 13 Quai d'Anjou, on the Ile Saint Louis. From there, he painted the banks of the Seine, the bridges of the Ile de la Cité, and various oils representing the cathedral of Notre Dame. At the end of 1869, Guillaumin had obtained a hard night job at the Paris City Council, which meant he had three days to paint. In 1903 he recalled those years: «for ten years I led the life of a convict, spending three nights a week at the service of the Paris City Council, while still working during the day». He would set off with just one black coffee to warm him up, his paints and one or two canvases. On 2 July 1876, he told Dr Gachet: «As from next Monday and for the next four weeks, you will find me here on Mondays, Wednesdays and Fridays. If you should come next Monday, old Cézanne told me he will drop by around 6 o'clock to see my mother and he will have dinner with us». Cézanne and Guillaumin used to work together at the Parc d´Issy and at Chatillon. Some of the works painted then undoubtedly completed Guillaumin's contribution to the 1880 Salon. Those were the years when the studio at 13 Quai d'Anjou was the scene of lively meetings, of discussions on the subject of painting and on the exhibitions to be prepared, of happy encounters, particularly with Pissarro and Cézanne, with doctor Gachet who welcomed them in Auvers and offered them the opportunity of discovering engraving, with Eugène Murer, his childhood friend from Moulins, to whom he introduced his friends, and whose little restaurant ensured that they got a proper meal during the days «in the galleys». At the 1880 Salon, Guillaumin presented 18 oils and a few pastels depicting the suburbs of Paris, Fontenay, Chatillon, the Port of Austerlitz close to which lived one of his brothers, whose address he had given to be included in the catalogue. Regarding the paintings of Paris, apart from the one representing the Pont-Marie, their titles do not seem to indicate that the Bridge of the Archbishop's Palace was depicted in any of them. Zola pointed out that Pissarro, Sisley and Guillaumin set out to render aspects of the nature around Paris in the true light, without the slightest unexpected colour effect (Le Voltaire, 19 June). The painting from the Thyssen-Bornemisza Collection is constructed around a simple composition, based on the oblique line of the river bank leading to the background marked by the horizontal line of the bridge, the same importance being given to the sky as to the rest of the painting. The signature, a G with the large loop in which are included the letters «UI», is characteristic of the beginning of the 1880s. 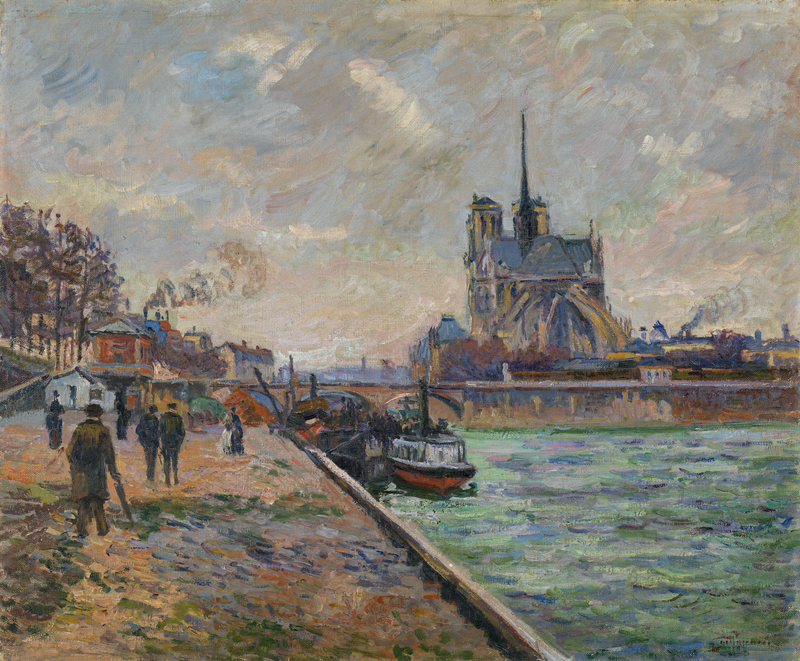 Like Pissarro and Cézanne, in that period Guillaumin was interested in passers-by and people strolling along the banks. In the previous series he had preferred to represent the workers unloading the barges, those sifting sand and the little coal thieves. It would be interesting to compare this painting with that of the Blot collection which shows a variation in size (60 x 81 cm), in the number and place of the characters and in a boat crossing the Seine; the artist placed his easel more to the left and further back with regard to the bridge. It seems that both paintings belong to the same period. 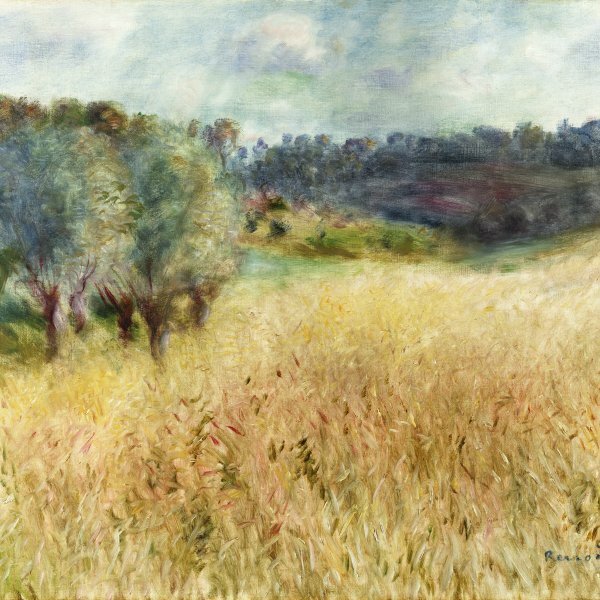 The composition is sober and dense, the brushstrokes are solid, rapid, overlapping different tones, which reduces the effect of transparency of the water and intensifies the impression of colour density; the sky is painted with nervous brushstrokes, combined with large rough sweeping strokes which convey the clouds racing by and the vagaries imposed on them by the wind.